← Do You Have an Emergency Fund? When my kids were young we didn’t really have a lot of money so any time they received any money from anyone they were encouraged to put it in a piggy bank to save. Sometimes they did and sometimes they couldn’t wait to spend it. I tried to help them save, but it didn’t always turn out the way I hoped – and it wasn’t always through any fault of their own or anything they did or didn’t do.  That’s a whole other story though. A lot of kids are never taught the importance of money at home or at school. I’ve always said that personal finance should be a course that is taught in school starting in the lower grades, but so far, no one has ever listened to me. So, it’s up to the parents to teach kids what they need to know and the earlier you start, the better off your child will be as they grow up. 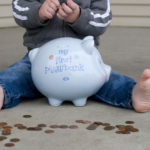 How you teach kids about money will depend on how old they are and what they’ll be able to comprehend and understand. Below are some different ways that can help teach your children about money based on their age. Use a clear jar or piggy bank so your child can see how much money they are accumulating. Just the sheer joy of watching their money grow will make them want to save it even more. Try to make a big deal out of it every time they put money into it so they soon realize the value of money. If your child expresses an interest in something they want, show them that it costs them money. Find out how much it is and help them count their money. This way they can save up for what it is they want. You can offer to pay for half if they save up the other half. This will motivate them more to save for the things they want. Set an example for your kids. They are watching you when it comes to money so start your own piggy bank and every day put whatever change you have left over each day into it. They’ll see that not only should they save money, but their parents do the same thing too. To help them make money, give them age appropriate chores around the house and pay them a little money for doing them. This should be done outside of their normal chores so they’ll know that some things are expected to be done but extras are like having their own job and responsibilities they can make money from. Give your tween a taste of real life and don’t just hand over money every time they think they want something. Do they want the latest and greatest cell phone out there? If so, make them earn the money to pay for it on their own – however, you can offer to pay for half if they earn the other half of the money. They can mow the lawn or a neighbor’s lawn to make some money. Have them ask the neighbor’s if they need some brush removed. Make kids work for the money they need and not only will they appreciate whatever it is they bought more they’ll know that things aren’t just handed to them because they think they have to have it. Make sure they realize they need to prioritize the money they spend. Remind your tween that if they want that new phone they won’t be able to get the new boots they’ve been saving for. They need to know that in order to have one thing, sometimes you have to give up something else. This makes them think about how they really do want to spend their money. They might choose a cheaper phone so they can have the boots and the phone. Go with your teen to help them open a bank account. Put your name and their name on it and make sure the bank gives them a passbook for their savings so they can see the money grow each week or month. If they are saving for a car then they’ll be able to have a goal they want to reach. Teach your children about credit cards and make sure they know exactly what harm can be done with them. They can get into deep debt extremely fast – this will not only ruin their credit, but they will also be responsible for paying that money back. Teach them that debt is something you never want to be in – particularly credit card debt. Your child’s age will determine how you go about teaching them about money. It isn’t always easy to teach a child about money, but if you don’t start early teaching your child about money then someone else will. Do you really want that? But, no matter how old your child is, it is vital that you teach them to give back – whether they donate to a local charity, send items overseas to soldiers, or buy a bag of food for an animal shelter – always teach them to be grateful for what they have and to share their blessings with others who aren’t as fortunate. Let kids know that if they make $10 they should donate a percentage of that money to a charity of their choice. Learning to give early will benefit them later in life – teach them early because one day they may have a great life and it could be taken away in a matter of minutes. They might end up being the one who needs some help. 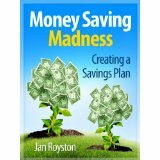 This entry was posted in Kids & Money, Saving Money and tagged kids, save money, saving money. Bookmark the permalink.